Wielding an ever-changing To-Do List and a travel itinerary thousands of miles long with the help of an ever-present coffee cup in hand, Lori A. May is a freelancing maven and idea-generating-then-put-said-idea-into-action wizard. Her organizational acumen, long hours, and miles on the road have helped her carve an editing, writing, teaching, and presenting career that spans not only fiction, nonfiction, and poetry, but also social media, marketing, and literary citizenship. She is the author of the newly released full-length poetry collection Square Feet (Accents Publishing), as well as The Low-Residency MFA Handbook: A Guide for Prospective Creative Writing Students (Continuum/Bloomsbury), stains: early poems, and two crime novels. Her essays, reviews, articles, and poems have appeared in numerous print and online journals. She is the founding editor of Poets’ Quarterly, an editorial advisor for River & South Review, and a nonfiction editor for Kaylie Jones Books. Observer. Doer. Presenter. Reader. Speaker. Teacher. Reviewer. Freelancer. Editor. Writer. Traveler. Literary Citizenship Championer. Poets’ Quarterly Leader. Meet Lori A. May. Dawn Leas: I know you as a have-coffee-cup-will-travel person, but Square Feet is firmly planted in home. Did you start out knowing home and marriage would be central themes or did this evolve as you brought the individual poems together? Lori A. May: The poems began in an individual scope, but I soon noticed the pattern and domestic themes. Only after that, maybe after a dozen or so, did I focus more intently on uniting the images, metaphors, and voices. DL: People often assume that all facts and events in a poem/poetry collection are true to the poet’s life. Is that the case with yours or is it a blend of fact and fiction? LAM: This is not an autobiographic collection. I do believe we always influence our work, of course, as we can’t help inflect our own personal slant whether through what we’ve seen or heard, or personally experienced. Overall, though, I wanted to explore the themes in Square Feet from outside of my own experiences and to sort of bring forth a few voices that contribute to one story. There are a number of narrative speakers in the collection all feeding the main couple’s experiences. DL: Can you tell us the story behind the title? LAM: The title came to me as a gift, overnight, once I knew the direction of the collection. 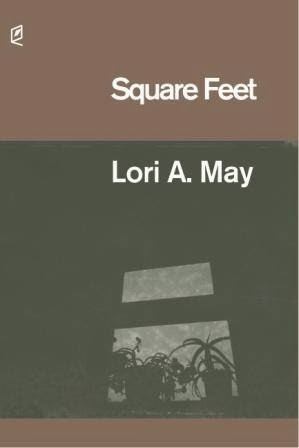 I immediately liked the idea of “square feet” and how it relates to space inside a home but also carries an awkwardness in the phrasing when I think about our human footprint and how we live in our domestic spaces. On the best of days, we’re most often fumbling through life trying to gain some footing, some balance. Perhaps that’s most true in our personal lives and so I thought the phrase worked on multiple levels for this collection. DL: You alternate between first and third person in this collection. Did you begin each poem knowing you wanted to use one or the other, or did the right one present itself during the revision process? LAM: Each poem presented itself in a voice that contributed to the main story arc. I had considered whether that would congest the narrative, but I think each stands out for their views and observations. We have the main couple we hear from in first person and omniscient third person, and then there is third person from friends and families. I was intrigued by the process of shifting points of view to provide a lens on what the main speakers might not see in themselves, or say about their relationship. Of course, outsiders are not always kind, too, so those moments of judgment, I think, create empathy for the main couple. It’s so easy to judge others and yet that saying about not knowing what goes on behind closed doors is true. There is more to the main couple than most of the other speakers know, but the reader gets to see that. DL: Speaking of revision, how do you approach it? LAM: There were poems that I thought would make the final collection but in my revisions I opted to omit for one reason or another. I wanted to keep the voices clear and the story arc visible, so anything that could potentially detour those plans was left out. I was also blessed to have an incredible editor and editorial team that painstakingly went over every line, every word, and every piece of punctuation with a laser eye to make sure everything was intentional. I play with words and phrases, so there’s always the test to see how an outside reader will interpret a purposely awkward phrase or spelling. DL: Can you name one or two poets whose work you admire? LAM: Molly Peacock has always been a favorite of mine. She has an incredible eye on the page that brings the so-called simple things to life with such beauty in her language choices. She’s also an incredible prose writer and her poetic style carries over across the genres. I am always mesmerized by her writing and frequently return to her work. I’m also a fan of Cornelius Eady. His voice—on and off the page—is musical. He has an incredible rhythm that makes his words sing and his images come to life. I could listen to him read all day. DL: Favorite place to write? Favorite time of day to write? Music or silence? LAM: I work best in silence and find my most productive time of day to be creative is in the early hours. I’m most often at my desk around 6:30 in the morning and don’t leave, except for coffee refills, until lunch. I work at my desk in my home office and avoid as much real-life to-dos as possible until the afternoon when my mind becomes more task-oriented. That’s when I’ll turn to social media, writing book reviews, reading for pleasure, and sometimes editing. After a nap, of course. DL: You write across genres. Do you favor one? LAM: My favorite is always what I am working on at the time. I really do enjoy writing fiction, nonfiction, and poetry equally and they each feed the other creatively and strategically. What I mean by that is that it’s wonderful to have an additional project on the go that I can turn to when I am worn out by the other. I’ll work on a nonfiction project for a few hours and take a break to play with a poem. Or, I’ll be working on a series of poems and take a break to toy with a story idea. I’m always working on something. I never have an excuse to walk away from my desk. DL: Why is being a good literary citizen important to you? DL: What’s next on the horizon for you? LAM: I’ll be traveling a good portion of the year, as always, and am keeping up with my freelance, short creative pieces, and book reviews. It’s a busy year in the best of ways. First with Square Feet and then in December I’ll have another new book out—a nonfiction title published by Bloomsbury. During AWP in Seattle, I’ll be signing copies of Square Feet at the Accents Publishing table in the bookfair (AA3) on Thursday Feb 27, from 12-1pm. I’ll probably also be around the Bloomsbury Publishing booth in the bookfair (2101) at some point. I try to update my website with appearances and events throughout the year, so I encourage readers to visit www.loriamay.com for updates as they happen.